It is little surprise that Tom Hanks is rumoured to be bidding for the rights to Oscar Pistorius's life story. Pistorius makes Hanks' former alter-ego Forrest Gump look like a perennial under-achiever. The South African had his legs amputated below the knee when he was 11 months old, yet on Sunday he ran against the world's best 400m runners at the Norwich Union British Grand Prix in Sheffield. The 20-year-old, whose j-shaped carbon-fibre prosthetics have inevitably earned him the nickname "Blade Runner", finished a distant last behind winner Angelo Taylor. Yet he believes Sunday's race is just the start of his amazing triumph-against-the-odds story. "I have a dream of competing at the Olympic Games in Beijing next year," he says. However, every great story needs a bad guy and in this case it is the IAAF, who could be about to put an end to Pistorius's dream. World athletics' governing body passed a rule in March that prohibited "the use of any technical device that provides the user with an advantage over another athlete not using the device". The IAAF denied the rule was specifically aimed at the South African, but it nevertheless seemed to end his hopes of competing against able-bodied athletes. Under pressure, the IAAF relented last month, allowing Pistorius to run in open competition while it carried out further research. "We will be filming Oscar in race situations, then measuring things like his stride length, how he distributes his speed and his energy over the whole lap," Nick Davies, communications director of the IAAF, said. Pistorius ran in the B race in Rome on Friday, finishing second behind winner Stefano Braciola in a time of 46.90 seconds. On Sunday he was hampered by the wet conditions in Sheffield and clocked 47.65, well short of the World Championships qualifying time of 45.95, before being disqualified for running outside his lane. The IAAF filmed Pistorius on each occasion to see if the blades gave him an unfair advantage. The South African believes a ban from able-bodied competition would constitute discrimination and suggests he would take the IAAF to court in such a case. Were he to do so, the IAAF would have a formidable opponent accustomed to fighting his corner. Pistorius was born without fibulae (calf bones) and had to have his legs amputated below the knee when he was 11 months old. His father, Henke, remembers Oscar being bullied as a child. "When Oscar was three, he had just two spikes for feet," he said. "Once these two older boys started pushing him backwards and forwards until he fell over. Oscar got up and they did the same thing again two or three times." Pistorius was unable to defend himself, but a year later the same thing happened and it was a different story. "The same two boys tried it again and when Oscar fell, he grabbed the boy by the chest and kicked him on his chin with his prosthetic limb. The guy fell down and screamed to high heaven." The prosthetic limbs are moulded from lightweight carbon fibre into a shape inspired by a cheetah's rear leg. The IAAF is concerned about the energy they release, the length of stride pattern they allow and the fact they do not release lactic acid. The curves and tapering of the prosthetic mean energy is moved to the "toe", where it is stored until being released when Pistorius pushes off from the ground. 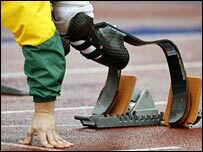 IAAF spokesman Davies says the IAAF has evidence that the spring in the limbs gives Pistorius a "three to four metre stride" which he insists is "not humanly possible" and hence an unfair advantage. 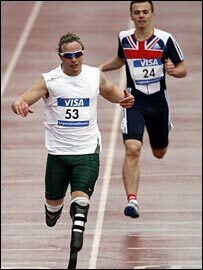 Yet the athlete argues that his stride is in fact no greater than if he were able-bodied. He argues the prosthetics are not bionic and actually give out less energy than an able-bodied athlete's legs would. Finally there is the issue of lactic acid. "If you don't have calf muscles, shins or feet, you obviously cannot have any lactic acid there or experience the problems that other athletes do because of it," says Davies. Athletes usually tire in the final stages of a 400m because of this build-up of acid. In contrast, Pistorius - who is a slow starter because of the time it takes for him to get into his stride - maintains his speed in the home straight. He argues: "I have the same ratio of blood per muscles in my body as everyone else, and the only way you'd get less lactic acid would be if that ratio was less." IS PISTORIUS GOOD ENOUGH FOR THE OLYMPICS? Not at the moment. The South African's best time is 46.34 seconds, which puts him a huge three seconds behind Olympic champion Warriner's best. Pistorius stands fifth in this year's South African rankings with a season's best of 46.56. Yet the 20-year-old argues he will improve massively if allowed to compete against the world's best - which is what will happen for the first time in Sheffield on Sunday. "It's the first able-bodied international race I've had against all the fastest guys in the world," he told BBC Sport. "I've got a lot to learn and I don't think I could learn it against any better guys than the ones I'm competing against. So I'm pretty excited. "In four to five years' time I want to be running under 45 seconds. Why shouldn't that be possible?" 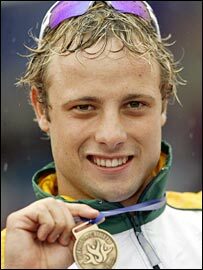 In a recent poll conducted by Athletics Weekly magazine, 68% of readers felt Pistorius should not be allowed to compete in the Olympics. And British 400m runner Tim Benjamin says he does not think the South African should be depriving others of a place in Sheffield. "If you have done the standard, you have done the standard," he says. "But then, with his personal best, he should not be in the race in Sheffield because he is not fast enough." Yet Benjamin admits he is full of admiration for the 20-year-old and hopes he can succeed. "It is a good message and I really hope he does well," Benjamin says. "I cannot believe the times he's running - it's amazing." Pistorius's initial aim is to be treated simply as an elite athlete, just like Benjamin or Warriner, and not as some kind of side show. And he believes the race in Sheffield will be the first step in achieving that ambition. "It's nice to know I'm being seen as an athlete and not just someone using prosthetic legs to compete at the level I'm competing at," he told BBC Sport. "It's become a debate without any evidence or facts behind it, so it's been a bit frustrating, but we're moving away from that now."